In addition to having a thing about French graphics I also have a thing about Birds… Swallows in particular! I just love their shape and the blue back color of their wings. 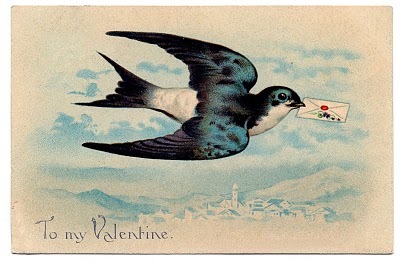 This one is a really fab vintage Valentine postcard, I think it would make a great gift tag too, maybe with a little glitter! 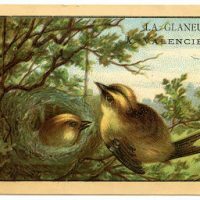 « Fabulous French Ephemera – Chocolate! Yes, I’m so sorry, I’m several weeks behind on my email right now! Between Christmas and being ill for over a week, I got really backed up. I’m going to try to tackle some of it tomorrow. I will look for yours! Thank you for the freebie Valentine images. It is really an inspiration to get that heart paper out and start creating some. I am making them for St Jude’s card drive for ill children. God Bless you always for your kindness on sharing your talents with others. There is so much to see on your site- I’ve been hopping and jumping all over the place ooohing and aaahing! Thank you for everything, but especially the flowers and the French labels and ads!! This is such a beautiful addition! I used this image on a snippet roll along with the book marks of the actresses you shared with us! I linked here for others to find you. I need to make a Valentine card with no red and knew I could find something on your site. Your blog is definitely my “go to” favorite. Thanks so much.